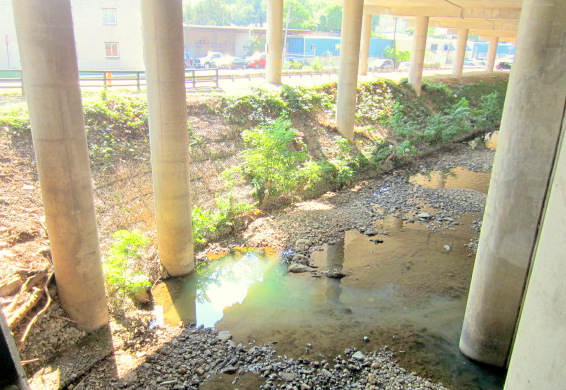 A milky white effluent was seen flowing yesterday from a pipe near the Union Avenue bridge. Earlier, the effluent was a sickly orange brown. 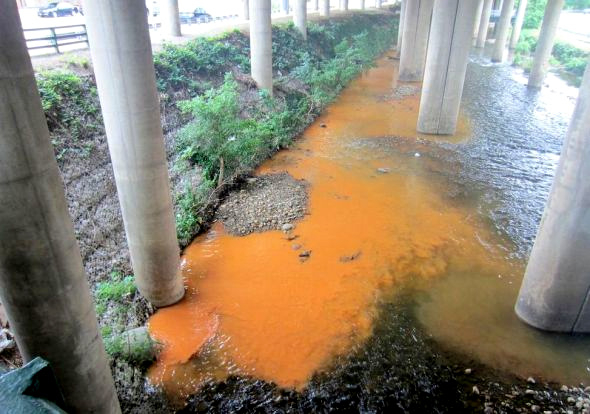 Above: On July 2, something very orange was flowing out of the pipe just southeast of the Union Avenue bridge over the Jones Falls. Yesterday, when the Jones Falls was a vivid milky-white color near the Inner Harbor and about 200 menhaden fish were found dead, there was also milky-white effluent coming out of a pipe upstream, at the Union Avenue bridge in Woodberry. 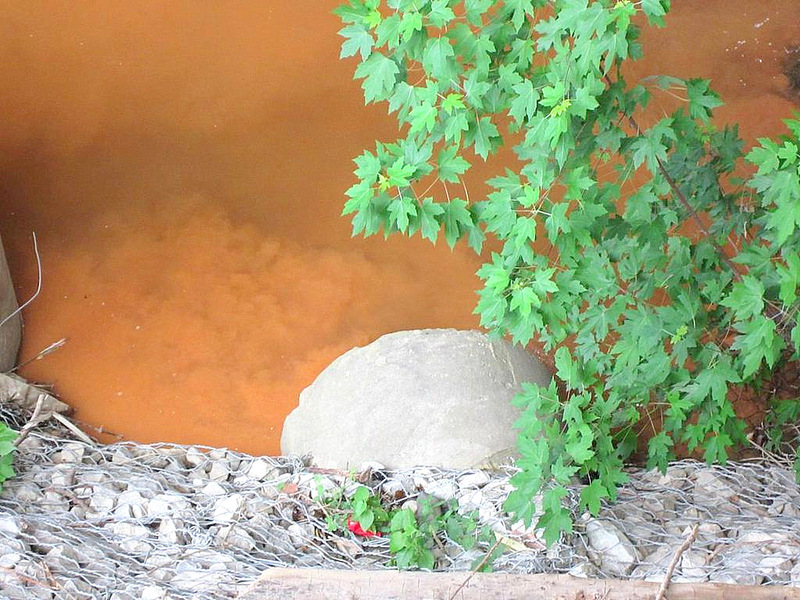 Reader Teresa Duggan noticed the pollution event, snapped some photos and sent them to us. Duggan’s been keeping her eye on the spot because it’s not the first time she’s noticed the water looking bad there. She sent us some photos from July 2 that are even more alarming – with the water around the pipe stained in an “sickly orange-brown,” as she put it. “The effluent was going strong at 8:20 a.m. and I took a photo. And it was still the same when I returned at 5 p.m. that day,” Duggan wrote. She said the water was also discolored the following morning (July 3), but was “less dramatic looking” because of an intervening rainstorm. In both cases, the spot was a concrete pipe – possibly a storm-water outfall? – on the east bank of the stream just below the Union Avenue bridge. Speaking with the Baltimore Sun’s Tim Wheeler yesterday, an MDE spokesman and the Baltimore Harbor Waterkeeper Tina Meyers said the immediate cause of the Inner Harbor fish kill was nutrient pollution that promotes excessive algae growth. 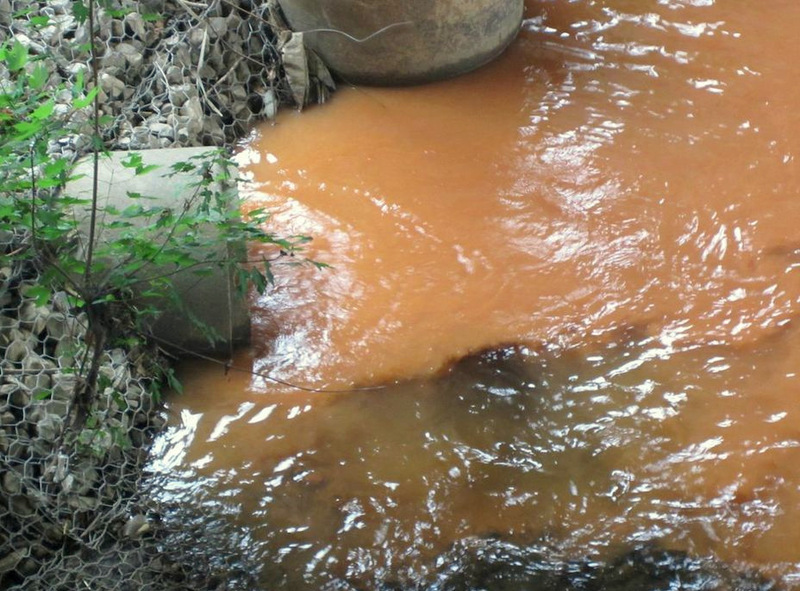 But since nutrient pollution from runoff and failing infrastructure is a longstanding problem along the Jones Falls, what caused these extreme events – the alarming white-color, fish-kill etc.? A spokesman for DPW told the Sun that sewage is not the likely cause since there were no high ammonia levels recorded in the water. That points to polluted, nutrient-laden storm-water runoff, no? So was this what was flowing out at Union Avenue? And was it polluted with sewage (which has that whitish look, we’ve learned.) Or something else? And what about the orange stuff? In any event, as you investigate this incident further, MDE and DPW, the Union Ave. bridge is clearly one worthwhile place to check out. “One of our fish kill investigators and a water inspector went to the site this afternoon. No discharge was seen, the stream was flowing clearly, fish were seen swimming.